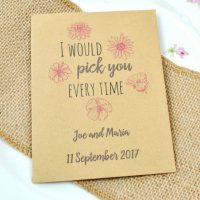 Categories: Unusual & Unique Wedding Favours, Personalised Seed Packet Wedding Favours, Recycled Manilla Packets. We think this bespoke seed packet wedding favour is a great idea, if we do say so ourselves! 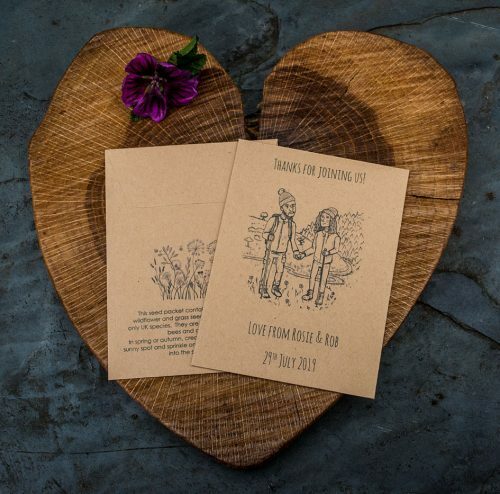 These favours add a far more personal touch to your wedding day and as gifts for your guests. 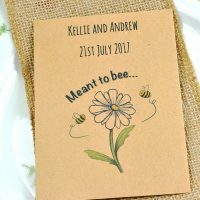 We will create an image of you both to print on recycled manilla seed packets, with seed sowing instructions on the back. The seed packets are 9 x 12 cm in size and the seeds will be in a paper sachet inside. 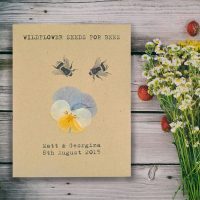 The seeds inside the packet are a very generous mix of British wildflowers and meadow grasses so that your guests can create a mini meadow in their garden or in pots. These wildflower meadow seeds will grow to attract many insects including bees, butterflies, moths, beetles, ladybirds and hoverflies. Perfect for creating a little haven in your garden and for doing your bit to help our struggling insect wildlife who are under threat from lack of wildflowers and the destruction of their habitats. The mix can also be sprinkled onto large patio pots or a number of smaller ones. How it works is like this – you send us a photo of you both (maybe doing some hobby you both enjoy or just of yourselves) and a bit of info relating to that image, including your names and wedding date. So, if you like cycling, you might send us a photo of your both on bikes or a tandem and a bit of info to make the design a bit more personal as well if you like – eg, a particular bobble hat one of you always wears whilst cycling! Ben will then create a quirky line drawing of the photograph and it will be printed on the front of the seed packet. He will send a proof for you to approve before it is printed. The cost of this design work is £60 and you will also get to keep the original digital artwork. If you require just the artwork and no seed packets, then that is possible too. The design work cost needs to be ordered separately here. Once that has been paid, please then order the seed packets from this page (assuming you want the design printed on the seed packets). If you are having just the design, the file will be emailed to you once the artwork has been approved by yourself.